Let us help you make your pet part of your special day! We know you want all of your family members present on your special day and that includes your pet. Our team can provide professional and loving pet care for your furry family member on your big day so that you do not have to worry about Fido stealing food from the buffet or going potty in front of the photographer. Whether you are looking for your pet to be your ring-bearer or just make a guest appearance for photos on your wedding day. Please review the information below then contact us to learn more about our customized wedding day pet sitting service! 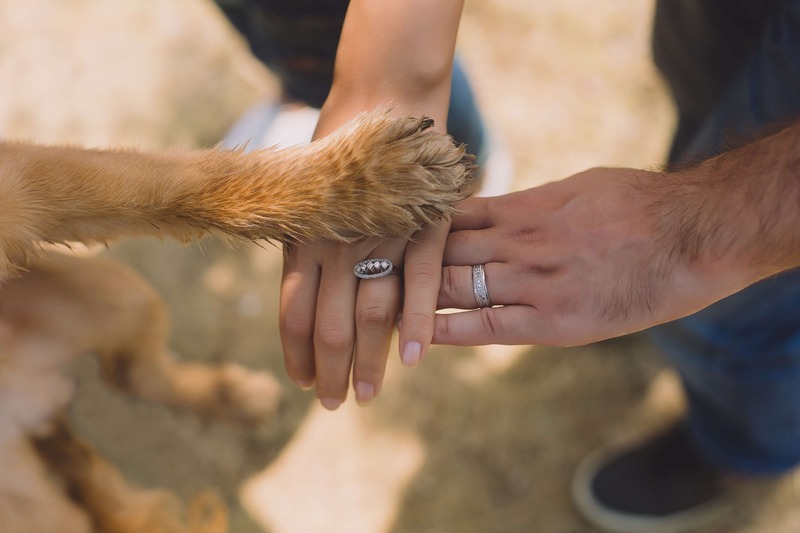 We offer a consultation in-person for weddings so we can all begin to think through all of the details and learn more about your dog’s personality and your expectations for the entire day. The cost is $25. We would discuss your entire event agenda and determine your pet’s involvement in each activity so that we will know where he should (and shouldn’t) be throughout the day. For example, would you like him there when your bridal party is doing hair and makeup or could we use this time to practice walking him down the aisle? What motivates him – is he treat motivated, toy motivated? Does he understand hand signals? Those are just a few of our many questions that we would discuss during the consultation. We also have some policies we cover – for example if you are getting him groomed the day before please make sure it’s a groomer he’s been to so that there are no surprises! Of course this applies more to fluffy dogs but something we just discuss with all pet parents. Pre-ceremony rehearsal, pre-ceremony pet sitting, transportation to ceremony for your pet, dressing up pet and final touches brush up upon request, supervise your pet during the ceremony including handling for photos, assist your pet with their “role” such as best pal or ring bearer, provide standard care such as potty breaks, feeding, and water, walks and playtime, continued pet sitting services throughout reception. Overnight Sitting on your wedding night, honeymoon sitting, pet taxi to groomer before ceremony. Typically we travel within a 100 mile radius of Washington, DC for wedding services. We may be available to travel beyond the DC, MD, VA region and are open to discuss any location. Our team is well-traveled and our passports are ready! We assess a mileage fee of $.60/mile. Our sitters are also paid for travel time and travel time will be included in the invoice. If our sitter is working over 5 hours we ask that they be granted a small break to eat lunch or dinner. Our rate is $50/hour for ceremony services with a 4-hour minimum. We charge a travel fee in the amount of $.60/mile from the sitter’s home in Washington, DC. We also bill for travel time from the sitter’s home in DC. In addition to the cost we would request to have permission to post a photo or two and a recap to our website or social media accounts. We require a 4-hour minimum booking for wedding day services. We require that our team have the opportunity to take a break during long shifts. Broken down: $25 consultation, 8 hour workday at $50/hour plus $24 mileage. *Please note we are unable to discount services. Learn more on our FAQ page. For scheduling purposes we are currently accepting wedding clients for weddings taking place in the first half of 2019. If your wedding is scheduled for July 2019 or later please check back with us in May. Please email kim@patrioticpetcare.com to inquire about services. We know how difficult it is to plan a wedding. We are happy to assist with everything pet related from including your pets in the ceremony to caring for your pets while you travel on your honeymoon. With our help your family can enjoy the wedding instead of helping to care for your overly-excited pet! We customize our wedding day pet sitting services to meet your needs. Each couple has a unique vision for including their pet in their ceremony and we will work with you to decide the best approach to transform your vision from an idea into cherished memories! We love seeing happy couples!